This approach to creating a healthy menu plan is based on including selections from at least three food groups at each meal (two groups for snacks). Throughout the day you will need to vary which food groups you choose, with the Fruit and Vegetable Group as the most prominent and the Fat Group with the least number of selections. Your other selections will be from the Grains, Protein and Dairy Groups. Another way of talking about a healthy menu plan is to start with your main food, usually a Protein food, then add a food from the Grain or Dairy Group and several selections from the Fruit and Vegetable Group, with occasional additions from the Fat Group. When all the foods are on your plate, there should be a colorful variety that is attractive to the eye and pleasing to the palate. Overall, you should limit high fat foods, those with added sugar and overly processed foods that are high in sodium and chemical additives. This includes most fast foods. Scroll down to the bottom of the page for more information about the food groups and particularly the serving sizes for the foods within these groups. To help you create a healthy menu plan, here are some comparisons of good choices and poor choices. 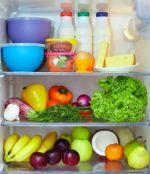 You will see that each of the good choices includes at least three food groups, and the poor choices tend to focus on simple carbs and fats, neglecting the group that should be the most plentiful, Fruits and Vegetables. Keep in mind that these are just examples. You can add healthy foods or mix and match the foods in the healthy menu plan choices, as long as at least three food groups are represented in each meal, two for snacks and at the end of the day you have had 2-3 servings from each group, and 5-6 servings from Fruit and Vegetable group. I would like to hear from you with your example of healthy menu plans. Also, if you are not sure about a favorite meal, send me a description, and I will take a look at it and let you know. The amount you eat of the listed foods will depend on your calorie needs, but generally should be no more than one serving of each food. The amount of the listed foods will depend on your calorie needs, but generally should be no more than one serving of each food. Eat a variety of vegetables, with emphasis on the dark green, deep yellow, orange and red choices. Limit fruit juice and canned fruits in syrup, and eat a variety of fresh, whole fruits. The usual serving size for meat, fish and poultry is 3 oz. If you don't own a food scale, the usual guideline for visualizing meat servings in a healthy menu plan is that the portion should be the size of a standard deck of playing cards. Tofu can also be included in this group with a serving size of about 4oz. In addition, most health experts recommend that, for a healthy menu plan you should choose a leaner or low-fat version of the significant protein sources, and to remove all visible fat from meat. Health experts recommend that at least half or more of your servings of grain should come from whole grain sources. A serving for most solid fats and liquid oils is one teaspoon. Choose monounsaturated fats, such as olive oil more often than polyunsaturated (corn oil, soybean oil) or saturated fats (butter, lard). Avoid trans fats (margarine, hydrogenated oils) altogether if you can. Click here to go from Healthy Menu Plan page to Healthy Eating Nutrition page.